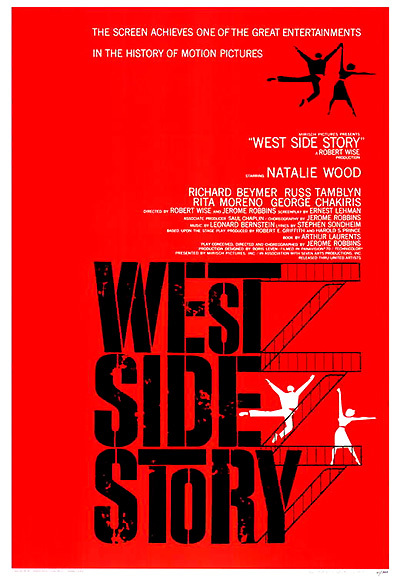 The Best Picture winner was a well-honored musical with Leonard Bernstein's score, fiery dance numbers and Stephen Sondheim's lyrics in a contemporary updating of Shakespeare's story of Romeo and Juliet (with rival NY street gangs - Puerto-Rican Sharks headed by George Chakiris and Jets led by Richard Beymer) titled West Side Story. The film had eleven nominations and ten Oscar wins (losing only its Screenplay nomination) - close to matching the record established by Ben-Hur (1959) with its twelve nominations and eleven Oscars. The Best Picture winner's awards included: Best Picture, Best Supporting Actor, Best Supporting Actress, Best Director (Robert Wise and co-credited choreographer Jerome Robbins), Best Art Direction, Best Cinematography, Best Sound, Best Musical Score, Best Film Editing, and Best Costume Design. 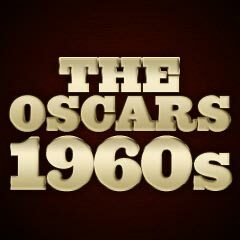 Only two of its ten Oscars went to actors (in supporting roles). Robbins was also awarded a special statuette for "his brilliant achievements in the art of choreography on film." Robbins was the only Best Director Oscar winner to win for the only film he ever directed. The Hustler accumulated four acting nominations, but none of the deserving individuals won. Three of the four performers who won acting Oscars were virtually unknown - Maximilian Schell, George Chakiris, and Rita Moreno, and the fourth, Sophia Loren, was known mostly as an Italian sexpot rather than as a serious, deglamourized actress. The winning group basically beat out lots of better known heavyweights. The Best Actor winner was 31 year-old Austrian-born Maximilian Schell (with the first of three career nominations - and his sole Oscar win) as Hans Rolfe - a disturbing Nazi-German defense lawyer who defended the Nazi generals for war crimes in Judgment at Nuremberg. [Note: Schell's role was basically a supportive one, and he was listed fourth in the cast. He became the first performer to win an Academy Award for recreating on screen a role he had originally performed for television.] He was the only performer to take home the film's sole acting Oscar win. Puerto-Rican-born Rita Moreno (with her sole nomination and Oscar win in her entire career) as the fiery, headstrong, tempestuous, skirt-tossing dancer, a Puerto Rican 'Sharks' member, and Maria's (Natalie Wood) friend Anita. She was the first Hispanic actress to win an acting Academy Award. She was also the second performer (after Helen Hayes) to win these four different awards - Oscar (1961), Tony (1975), Emmy (1977, 1978), and Grammy (1972) - by 1977, one year after Hayes. Although Breakfast at Tiffany's was nominated five times, and won two Oscars (Best Score and Best Song for Henry Mancini), it was not nominated for Best Picture. Producer/director Elia Kazan's Splendor in the Grass, nominated for only two Oscars (an unsuccessful Best Actress nomination for Natalie Wood and a Best Original Story and Screenplay nomination with Oscar awarded to William Inge), failed to achieve a Best Picture or Best Director nomination. In the same year, Natalie Wood starred in West Side Story as Puerto Rican Maria, one of the star-crossed romantic lovers (with singing dubbed by Marni Nixon), but was un-nominated for that role. Oscar-worthy nominees for acting roles in many overlooked films included James Cagney in his second-to-last film as European Coca-Cola executive C.R. MacNamara, and Hanns Lothar with his comedic, heel-clicking performance as Schlemmer - in Billy Wilder's satirical farce One, Two, Three (with one unsuccessful nomination for B/W Cinematography). Also overlooked was the young and promising Albert Finney for his role as hedonistic working-class Arthur Seaton in the British film Saturday Night and Sunday Morning (un-nominated for any awards), Vincent Price as the villainous Nicholas Medina in the second of Roger Corman's Edgar Allan Poe series - The Pit and the Pendulum, Sidney Poitier for his performance as Walter Lee Younger - part of a financially struggling Chicago black family in A Raisin in the Sun (also un-nominated for any awards), and Rosalind Russell for her performance as widowed Brooklynite Mrs. Jacoby, a stereotypical Jewish mother in A Majority of One. Vivien Leigh was un-nominated for her performance as a wealthy, widowed actress living in Rome - attractive to gigolo Warren Beatty in The Roman Spring of Mrs. Stone, and young Hayley Mills' role as an innocent Kathy Bostock in director Bryan Forbes' allegorical Whistle Down the Wind (un-nominated for any awards) was also un-nominated. And the last film of legends Marilyn Monroe and Clark Gable, director John Huston's The Misfits, received no nominations. Through a Glass Darkly (Sw.) brought Ingmar Bergman his second Best Foreign Film Oscar win, but was missing from the Best Picture nominees. Although Federico Fellini's La Dolce Vita had a total of four nominations (including two for Fellini himself for his direction and screenplay, another nomination for Best Art Direction, and an Oscar win for its Best Costume Design), Marcello Mastroianni was not nominated for his famed role as handsome, world-weary, desperate gossip columnist Marcello Rubini. [Later in his career, Mastroianni was nominated three teams for leading roles in Divorce - Italian Style (1962), A Special Day (1977), and Dark Eyes (1987).] His co-star Anita Ekberg was also not nominated for her role as buxom movie star Sylvia, who cavorted and danced in Trevi's water fountain in a black evening gown. Her entire career was unrecognized by the Academy.